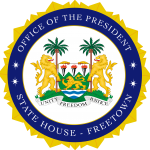 State House, Freetown, Wednesday 10 April 2019 – His Excellency President Julius Maada Bio has installed and inaugurated Paramount Chiefs Sadiq Kapuwa of Nongowa and Patrick Kanneh-Kabba of Nomo Chiefdoms, in the Kenema District, during a brief ceremony at State House. After the ceremony Minister of Local Government, Anthony Brewah, expressed thanks and appreciation to the National Electoral Commission and the various security sectors for conducting free, fair and violence-free elections, adding that the polls were conducted in conformity with the Chieftaincy Act. On his part, President Bio said he was excited to preside over his first installation ceremony since his election as President of Sierra Leone and congratulated the new Paramount Chiefs on their new roles. He said the event meant that the government had recognised them as Chiefs, which demanded a lot of responsibility on their part. President Bio noted that as they prepare to take up their new roles much was expected of them, especially in maintaining the peace and stability of their respective chiefdoms. He also urged them to use their experience and expertise derived from their professional careers in working with the government to bring development to their chiefdoms. “Paramount Chieftaincy is the building block to development in the country and must be able to work effectively. The culture in most settings is changing and that is making the work of Chiefs very difficult but as a government, we are trying to reconnect with the institution to ensure it is relevant again,” he assured. While delivering the vote of thanks, Paramount Chief Sadiq Kapuwa said he was thankful to God for the opportunity he had to serve his people, saying that that was a dream he had yearned for. He commended the government for providing the platform to conduct free and credible elections, adding that they were aware of the challenges ahead and were ready to face them.